WinSpace 3.0 Professional provides a small, viewable, freeform tic-tac-toe grid, bottom right, where the user can move around or resize miniwindows. As 19- or 21-inch monitors with 1,280- by 1,024- and 1,600- by 1,200-pixel resolution become standard for power users, the screen already looks like the wide-open spaces. Now along comes WinSpace 3.0 Professional from TriPlus Technologies LLC to create nine times as big a virtual desktop, extending beyond the borders of the monitor. The three- by three-window grid shows which windows are open in the desktop layout. The user can move around among the miniwindows in this freeform tic-tac-toe grid. 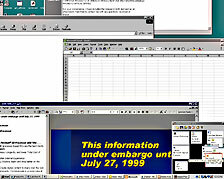 All desktop icons appear under each of the nine virtual desktops, and all open applications remain on the Microsoft Windows 9x or Windows NT task bar. WinSpace even lets the user enlarge windows to overlap multiple desktops. 'Clicking on an open app switches to the proper desktop layout. WinSpace works fine in general, but it tends to confuse applications that use multiple windows. For example, Adobe Photoshop has several floating panels to access features. The panels usually appear within the application's main window. But with WinSpace running, Photoshop got confused and popped up the panels in other virtual desktops. Sometimes the panels snapped back to difficult-to-access areas between virtual desktops. At higher resolutions and with the handy taskbar, WinSpace did increase the virtual space, but I found it to be virtually unnecessary.